Dr. Bill Robb has been serving the oil and gas industry, onshore and offshore, in the UK and internationally since 1995. 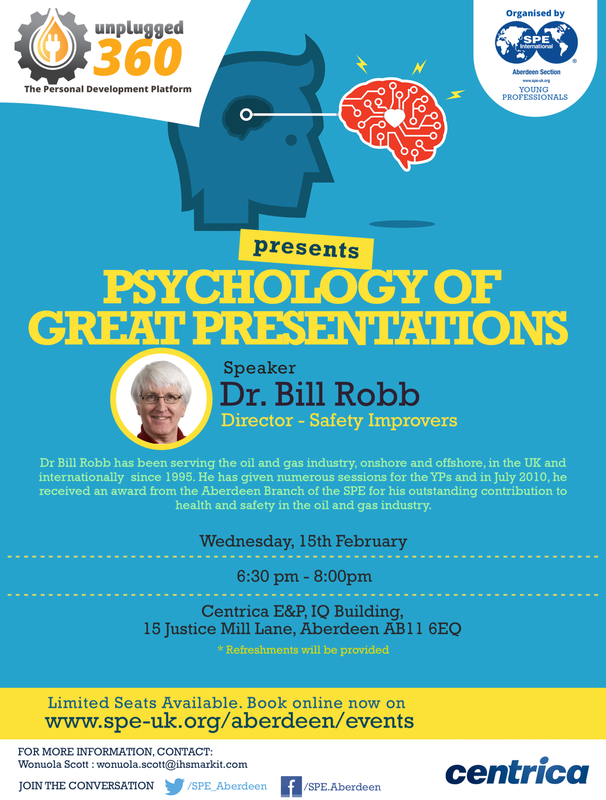 He has given numerous sessions for the YP’s and in July 2010, he received an award from the Aberdeen Branch of the SPE for his outstanding contribution to health and safety in the oil and gas industry. Being a good presenter is an essential soft skill. If you cannot capture your audience’s attention and keep it, and if you cannot give a concise and clear message, you cannot achieve your objectives. In this session we quickly summarise the basics. Then we will discuss some of the 20 psychological traits we have to overcome to ensure a brilliant presentation. We are often unaware of these traits – some in us as presenters and some in the audience – and they are rarely discussed in presentation skills courses and books. Understanding these traits and knowing how to deal with them will give you added confidence. This event is free to attend but booking essential.